Today’s #sundayhome is dedicated to ‘occasional’ chairs – to accompany & complement the sofas featured in week 1. My fave 5 coming up. Bianca Simple upholstered chair from Maison http://t.co/JcjeOcwb – Simple yet stylish @ £395. 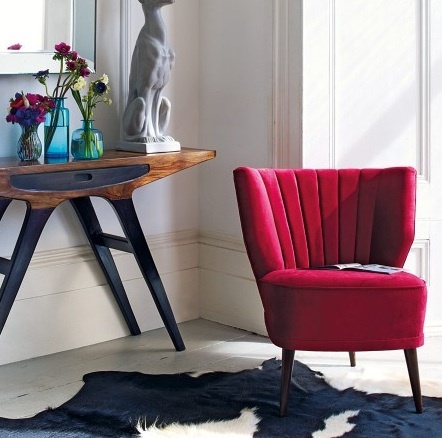 Cleopatra Slipper Chair from @grahamandgreen http://t.co/KqDJR3J1 – Not surprisingly currently out of stock. Fit for a Queen @ £475. Conrad Occasional Chair from @IndiaJaneLondon http://t.co/c9KSzmQz – Contemporary @ £595. Chamonix Velvet Chocolate Armchair from @sweetpeawillow http://t.co/vBQWE8wC – Matches sofa from week 1. Lounge in luxury @ £695. S-exy Love Seat from Design a Chair http://t.co/MLO7e1aO – Choose your own fabric. In love from @ £1058.